Whether it is in hospital or the community, The NHS Long Term Plan places older people at the heart of the new vision for the health service. The plan calls for an acceleration of the move towards same day emergency care. Other targets include an increase in the proportion of acute admissions discharged on the day of attendance from one fifth to one third, alongside a continued push on reducing admissions in the first place. Central to this is the creation of acute frailty services, with the target of ensuring an initial frailty assessment takes place within 30 minutes of arrival. This is based on good practice developed by the Acute Frailty Network (AFN) over the past three years, and the network has worked with around 70 hospitals in England. AFN programme director Deborah Thompson says the evidence shows an assessment known as either the Rockwood or clinical frailty scale has been shown to be effective: ‘It’s pictorial as well, so is useful for those patients who have cognitive impairment. 'As well as using it in emergency departments (EDs), we are seeing ambulance crews using it and identifying patients who need help from the frailty service before they even arrive at hospital. One of the places that uses the Rockwood scale is the Calderdale and Huddersfield NHS Foundation Trust, which introduced an acute frailty service two years ago. Nurse consultant for older people Renee Comerford says the service is now assessing more than 80% of patients within 30 minutes. But Ms Comerford says key to achieving that figure was putting a small team of nurses and therapists into the ED from 8am to 8pm as she found there could be delays identifying patients when ED staff were ‘really busy’. To achieve that they have had to expand the size of the team. There are now more than 20 staff. ‘Frailty services are effective, but they do need investment,’ Ms Comerford adds. Hospital arrivals are not the start of the patient’s journey. National Institute for Health Research Dissemination Centre clinical adviser Elaine Maxwell says it is important to see the frailty assessment as part of an ‘ongoing process’ started in the community and it will require hospital, primary care and social care IT systems that ‘speak to each other’. ‘The NHS England contract requires all primary care practices to identify people over 65 living with frailty. The GP assessment forms part of the enhanced summary care record,’ Dr Maxwell says. The plan also stresses the importance of reducing the need for hospital care. Some £4.5 billion of the extra £20 billion the NHS is getting by 2023 will go on community services, meaning their budgets will rise at a quicker rate than the one given to hospitals. This will help establish fully-integrated, community-based healthcare ‘for the first time since the NHS was created’. The plan makes clear that the work done through the vanguards and integrated care systems following the publication of the Five-Year Forward View in 2014 has provided the evidence needed. While emergency admissions per person are up 6.9% in the rest of the NHS, in those areas that have pioneered new ways of working they have been limited to 1.6% over the past three years. At the heart of the new system will be primary care networks aligned to geographies covering populations of between 30,000 and 50,000. Multidisciplinary neighbourhood teams with a range of staff including district nurses, GPs, social care, pharmacists, community geriatricians and physiotherapists, will be tasked with promoting independence, enabling speedy discharge, reducing avoidable outpatient visits and preventing emergency admissions. They will also need to offer a guarantee of support to people living in care homes. He is particularly concerned about the lack of a plan to tackle staffing shortages – a workforce strategy was expected to be published last year but the government now says it will be out in the coming months. ‘There is already a glut of jobs in the community and not enough staff to fill them,’ he adds. Health and social care services have worked together in Doncaster to set up a rapid response intermediate care team to prevent hospital admissions. It brought together a range of different teams and staff after a review concluded services were ‘complicated, difficult to navigate and inefficient’. The multidisciplinary team includes emergency care practitioners, community nurses and therapists. It was set up by the council and clinical commissioning group in early 2017 with the idea of providing short bursts of support to avoid older people needing to go to the local ED. Ambulance crews and GPs refer to the service, which sees a variety of patients, including those who have had falls, have dementia or have palliative care needs. After it was launched, unplanned admissions for trauma and orthopaedics fell by 17% and ambulance journeys are down by 15% for the over 65s. The Royal Surrey County Hospital in Guildford has been working hard to provide integrated care to older patients for some time. It set up an integrated discharge team around 15 years ago. The team of nurses and therapists had a good track record in helping to ensure patients could be discharged as early as possible. But in spite of this, the trust felt more could be done to ensure quick identification of frail patients who were arriving in the emergency department (ED). The solution involved setting up an acute frailty service two years ago. 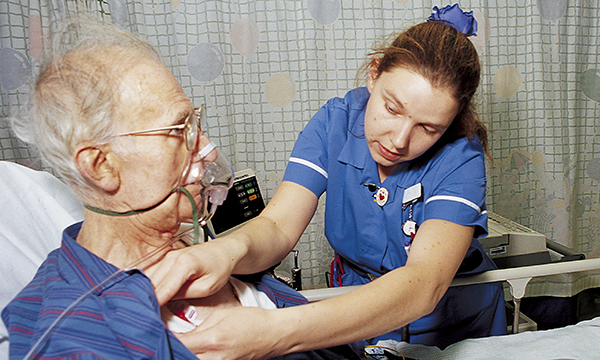 This involved creating a frailty team, including acute frailty nurses, to work in emergency care and reconfiguring an 18-bed general medical ward into an older people’s short-stay unit. The team aims to triage and identify patients within 30 minutes of arrival at ED. Individual care plans are put in place for all frail patients whether they are admitted to hospital, enter the short-stay unit or are discharged home. Average length of stay for patients aged over 75 has reduced by nearly one third since the changes were made.